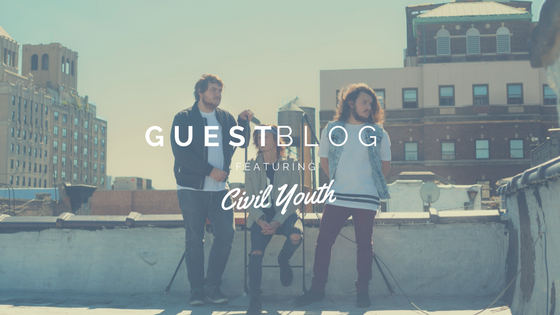 Fall and Halloween for Civil Youth usually consists of us going on tour or spending most of our time in the studio. Real fun and festive right… lol to be completely honest we really don’t give Halloween a second thought. It’s not because we don’t like dressing up and acting like kids, it’s just kind of how it goes. Maybe this year we’ll break our comfort zone and force ourselves to do something fun. I mean who doesn’t like candy… or free candy at that point! I’m writing this blog without Evan and Dan right now so I’m going to try to guess their favorite candy. I hope I get it right. Knowing Evan, he probably would go for something sour and gummy. Whenever we’re on the road we always manage to snag some sort of sour something. Dan, I think, is more into peanut butter stuff. More savory over sweet and he’s smart for going that route. As for me, I really don’t eat candy of any kind. If I’m going to eat something bad for me, it’s going to be cheesecake or something from Blue Sage (This bomb vegetarian place near me). If anyone is reading this and wants to give us candy though, please be our guest! We’ll take it on the road and eat it all within a day. Judge us. As for the show portion, we have done Halloween related shows in the past and I know it’s something Evan especially wants to bring back and make huge. We’re all really into it tbh I just vividly recall Evan being a huge advocate. We’d rent a huge space with dope sound and make everyone who’s coming dress up. All our friends’ bands would play. Maybe we’d even theme it… I don’t know, would you guys be into that? We could throw candy into the crowd, have punch and themed drinks and food. We could make it by invite only too so it’d be extra special. The more I talk about it the more I want to do it now… Look out in the future for this. Lol. In the meantime though, I know this year we have a couple covers coming out, and in light of the holidays maybe we’ll theme the video for you guys so we don’t seem as lame (: Anyway, until then we hope you guys have been digging our latest record, “Conversations” and be patient with our Holiday ideas! PEACE!